The award for Best Pop Video has never been given to a black artist and it’s been hard for black artists to best white artists in major categories. 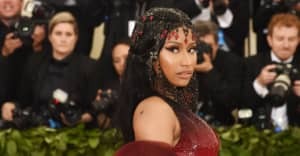 Last month, Nicki Minaj took to Twitter to speak publicly about her feelings on her two nominations for this year’s MTV Video Music Awards, for Best Female Video and Best Hip-Hop Video. “If I was a different ‘kind’ of artist, ‘Anaconda’ would be nominated for best choreo and vid of the year as well,” she wrote. Unfortunately, Taylor Swift took this moment to swoop into Minaj’s mentions to accuse her of trying to “pit women against each other,” despite the fact that Minaj was talking broadly about racial injustice in the music industry and said nothing about Taylor Swift at all. The Video Of The Year nomination that Minaj is seeking is the same one every artist wants—it’s been the most prestigious award of the night since the VMAs launched in 1984—but it has a very white history. INXS, Pearl Jam, Dire Straits, Neil Young and R.E.M. were the kinds of artists that dominated this category in the rock-focused early years of the VMAs. Only one of the first 11 winners was a woman, and that was Sinead O’Connor in 1990 with “Nothing Compares 2 U.” It wasn’t until TLC’s big win with “Waterfalls” in 1995 that the all-white run was broken. Those winners are TLC in 1995; Lauryn Hill in 1999; Lil Kim and Mya (with Christina Aguilera and Pink) in 2001; Missy Elliott in 2003; OutKast in 2004; Rihanna in 2007 and 2012, and Beyoncé in 2009. The award for Best Rap Video was created in 1989, when genre categories were introduced to the VMAs; but an R&B category wasn’t established until 1993, creating opportunities for more wins for the likes of Salt-N-Pepa, En Vogue and The Fugees. The Best R&B Video award was discontinued in 2007, however, when all the genre categories were dropped. In 2008, some of those genre categories—Pop, Rock, and Hip-Hop—were reintroduced, but music that could be considered R&B is now determined by the VMAs to be either Pop or Hip-Hop. The Best Pop Video award has never been won by a black artist in the category’s 15 years of existence. (It is worth noting that dancehall artist Bounty Killer, was a featured artist on a winning No Doubt song in 2002.) The award was, however, won by Ariana Grande and Iggy Azalea last year, making Iggy the only hip-hop act to do so. The loss of a separate R&B Video category is meaningful because black artists have statistically not been as likely to win in categories where they are pitted against their white counterparts—as proven by the woeful Pop category. Elsewhere, Eminem has been nominated for, and won, more Best Male Video awards than any other performer; he’s also been nominated for Video Of The Year more than any other solo male. Madonna is the most nominated solo female in the VOTY category, and U2 is the most nominated group. Of 148 nominations in the Best Male category over the years, 63 have been non-white; 10 have been won by black artists. The Best Female category paints a similar picture, with 55 nominations for black artists out of 152 overall, and 11 wins for black artists. Beyoncé is also one of the few black artists to win the (ironically titled) Michael Jackson Video Vanguard award for lifetime achievement. Of the 29 given out, only four black performers—Bey, LL Cool J, Michael and Janet Jackson—have received this award, as well as Hype Williams in 2006. Since its introduction in 2011, the Video With A Social Message category has been controversial. So far, it’s been awarded to Macklemore, Lady Gaga, Demi Lovato and Beyoncé. Although there have been nominees who have explored race-related issues, these videos have never won. The 2013 awards were particularly shameful: not a single black artist won a televised award. Janelle Monáe took home a statue in the “Best Art Direction” category, but that was presented off-camera. (The Best Hip-Hop Video award was won by Macklemore.) Meanwhile, Miley Cyrus twerked through her performance, and Katy Perry turned on the red carpet up wearing a grill. PS: Where are Azealia and Tinashe? We’re just saying; Azealia released one of the most technologically inventive videos of the year, and Tinashe made a video so good that even Kanye felt compelled to tweet it. All my videos deserve VMas and my album deserves a Grammy but I'll never get one because America doesn't like opinionated black women.